Have ebook readers surrendered to DRM? Posted on April 21, 2016 | Comments Off on Have ebook readers surrendered to DRM? Late in the first decade of the 21st century, solid opposition to DRM in music made the publishers back down. The arguments were that Digital Rights Management is ineffective against determined crackers, diminishes the value of purchases, and punishes the honest. However, readers have largely caved in to DRM in ebooks, even though the arguments are equally valid there, as confirmed by experience. 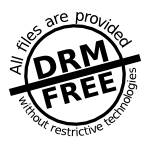 Some publishers don’t use DRM, and some authors don’t let their publishers use it, but a large proportion of e-books are restricted by encryption. I can’t find any figures on the proportion of sales, but DRM is the default with many major distributors, such as Amazon, and many readers just don’t seem to care. People are beginning to notice, though, that they don’t own a book under DRM; they only license it as long as the vendor supports it. The Sony Reader is dead. Barnes and Noble’s Nook is dying by slow stages. Many smaller publishers are issuing their books DRM-free; it’s mostly the biggest publishers that restrict access. My own e-books, Files that Last and Tomorrow’s Songs Today , are unencumbered by DRM. Removing DRM isn’t hard. You can find lots of pages with information on how to do it. I don’t know which ones work safely, since I don’t buy ebooks with DRM in the first place. If Simon and Schuster had its way, it could sue me for huge amounts of money for posting that link, but a federal judge ruled against it. So I’m legal in providing you that link. I hope. I also hope that eventually the big publishers will figure out that they’re only hurting their readers and losing business by restricting users’ ability to save and convert the books they download.